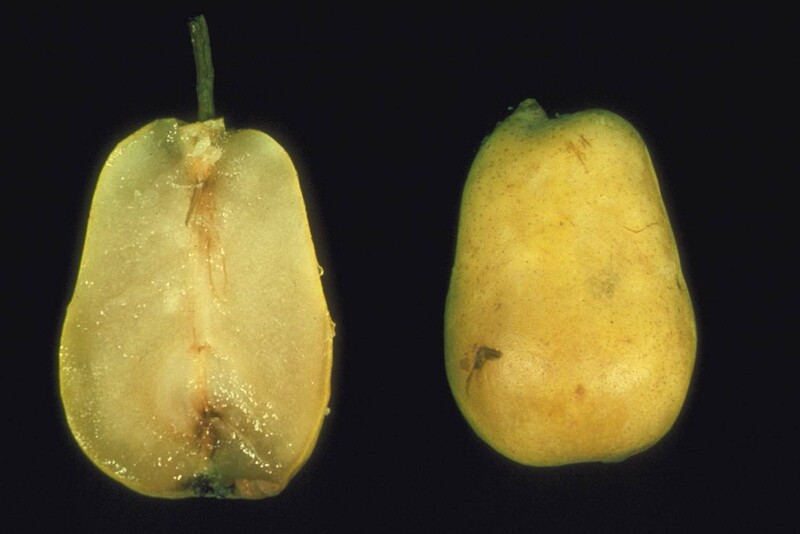 Watery breakdown can develop in fresh pears, especially the ‘Bartlett' variety, during storage and/or ripening following even short periods in cold storage. Watery breakdown can involve any part of the fruit, being most common in the tissue around the blossom end of the fruit. In California, the problem is more severe in some seasons, suggesting that a climatic relationship exists. In some seasons in California, watery breakdown has affected as much as 10% of fruit destined for processing. Affected fruit are not useable for either processing or fresh eating, and leakage from affected fruit can soil surrounding healthy fruit. Watery breakdown, as the name implies, is a soft, watery deterioration of affected tissue. When the affected tissue is cut or punctured, juice flows out of the fruit. Typically, the involved tissue is in the outer portions of the flesh, but in severe cases can move into the core tissue. The affected tissue is not discolored during early stages, but becomes brown with time. It is thought that the random pattern of symptoms development on individual fruits is related to other stresses that occur during handling (in tests, impacted fruits developed watery breakdown around the bruised area). Causes: The soft, watery breakdown results from softening of the affected tissue. Fruit that are cooled slowly and/or held at too warm a temperature are most severely affected by this disorder. Fruit of any maturity can be affected, but high maturity fruit appear to be most susceptible. Cool fruit as soon as possible following harvest, and hold them at as low a temperature as possible without danger of freezing. To minimize the incidence of watery breakdown, fruit should be cooled to near storage temperature within 1 day of harvest, and held at 0°C (32°F) or below for up to one-month storage, or -1°C (30°F) for longer storage. Check the soluble solids concentration in the core area (lowest soluble solids content) to determine the lowest safe storage temperature for each lot of pears. Mitchell, F. G. and G. Mayer. 1972. Watery breakdown of ‘Bartlett' pear. Calif. Agric. 27(5):6-8. Mitchell, F. G. 1992. Postharvest handling systems: Temperate Zone Tree Fruits (Pome Fruits and Stone Fruits). Chap. 24, pp. 215-222. In: Kader, A. A., ed., Postharvest Technology of Horticulturual Crops. Univ. Calif. Div. Agr. & Nat. Resources. Pub. 3311.